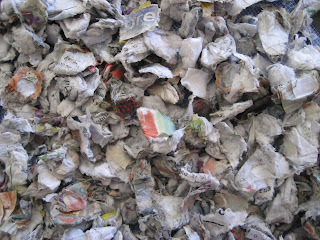 Green Grandma: Thursday's Truths & Tidbits -- It's about all that paper waste. What can YOU do about it? Thursday's Truths & Tidbits -- It's about all that paper waste. What can YOU do about it? Did you know it's estimated that up to 40% of landfills are made up of paper? Yes, it decomposes. So what is the problem? Methane. As paper decomposes, methane is released into the air, which I'm sure you know is simply a bad thing. What can we do about it? Well, today on Thursday's Truths and Tidbits, I thought I'd share some tips on how to cut back on your paper waste. Of course, the most obvious thing we can do is RECYCLE! Paper is one of the easiest things to recycle because, even if your curbside recycling doesn't include paper, you can always find a paper recycling bin in the parking lot of your local schools, churches, or fire departments. They seem to be everywhere, which is a good thing. Just pay attention to their guidelines before tossing things in that don't belong! If you print a lot of pages (as my writer friends and I tend to do), make sure you set your printer default to print on both sides of the paper. Using narrow margins and smaller font size can save paper as well. Instead of using tablet paper as scrap paper or for score keeping when you're playing games, use the back of an envelope or the blank side of a piece of mail before you toss it into the recycling bin. Use chalkboard paint or dry erase boards to write reminders rather than wasting sticky notes. Look for recycled content paper products. When given a choice, ask for email receipts rather than paper ones. Bonus: You won't have to touch the BPA-laden receipt! This should go without saying -- use cloth napkins and rags instead of paper napkins and paper towels. Seriously, this is one of easiest changes a family can make to cut down on their paper waste and there is no excuse for not doing it! Carry a reusable mug with you so you don't ever have to use a paper cup. Did you know that most paper coffee cups are NOT recyclable due to the chemical lining. Chemical lining?! That alone should concern you. What exactly are those chemicals and are they leaching into your hot coffee or tea? Yikes. It's up to us, folks, to make a difference. You know, drop in the bucket and all. Let's do it!